If your wondering just how good the Hurricane Rig is then take a look at the website of rig owner Paul Williams. He has been using his rig to shoot time-lapse sequences for an IMAX movie. Click here to go to his web site. In this video I look at the Today3D stereoscopic follow focus and rig controller. I have prepared a video looking at the current options for the Hurricane Rig. These include the Bolster Bracket for heavier cameras and greater stability. The new oversize hood for large lenses and the Canon XF105, the new Cheese Plate and last but not least the motorisation drive kit. We received this report from Stereographer Andrew B Parke about how they used the Hurricane Rig to shoot a 3D programme about the Indy 500 motor race. Bruce Schultz was the D.P. He asked me to be the Stereographer/Rig Technician for this Stereoscopic 3D documentary. We were calling it “100 Years at the Brickyard” during shooting as there is a historical perspective to the story and it was the 100th running of the Indianapolis 500. We rented a Cmotion stereo FIZ system from Radiant Images. We got motor mounting plates, a Marshall 24″ alignment monitor, and a NanoFlash3D from HD Cinema. And we got a transvideo 6″ on-board monitor from V.E.R. Sony EX1 & EX3’s paired were used on my Red Rock Side-by-Side bar for time lapse and race day footage. Mako Koiwai was the GoPro Stereo expert and 3DA1 camera operator for the days before the race. Joe Setele operated the 3DA1 Race Weekend. Camera Assistant was Brad Greenspan. 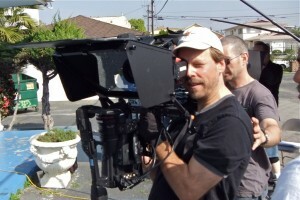 Most of our interviews were shot with the Hurricane Rig with F3’s. We interviewed most of the drivers and many alumni drivers as well as, team members, historians, Indy Car people, wives, etc., etc. We shot for 8 straight days without a day off leading up to the race and including race day. 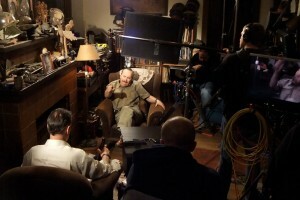 The shoot went remarkably smoothly considering the many variables of a documentary environment. Especially for a Stereoscopic documentary. The Hurricane Rig aligned very well. We used the “stiffener” bracket to remove any possibility of rig flex with the heavier cameras and all the accessories that we hung off the rig. We did have to re-align slightly when changing focal lengths, but it was quick to match the zooms and minor vertical or horizontal offsets. This is normal for 3D. Only much higher priced, specially matched zooms and cameras or motorized systems like 3ality’s can be aligned throughout the zoom range. We transported gear around the very large track (2.5 mile oval) via a magliner cart with the camera mounted on a high-hat. We had all support gear on the magliner. We found this could go anywhere including through doorways, elevators, hallways, etc. We had no major alignment problems due to vibration of the rig despite all the moving around that we did. We did have some minor cable issues for monitoring, but that was solved quickly. We carried a car battery to run the Marshall Monitor using an AC inverter for times when we could not plug into house power. We had block batteries to power the entire rig; cameras, FIZ motors with Camin controllers, nanoflash3d recorder and the tranvideo. We had a backup to use on-board anton-bauer batteries, but we did not use this option. During the race itself there were no tripods allowed in the pit area, so the Hurricane Rig went on the roof of the grandstands across from the Pagoda near the starting line. It was very windy up there. We found out from Alister Chapman later that we could have used some extra screws in the mirror mount to lock the mirror to prevent wind pressure from causing some minor mirror movement. Since Alister is a storm chaser (and hence the name of the rig) I knew that he must have some solution for shooting in high winds. It was a memorable race as the leader crashed in the final turn and came in 2nd, rolling across the finish line in a wrecked car. The Hurricane Rig was great for this project because it is lightweight, easy to transport, and has a good beam-splitter glass. 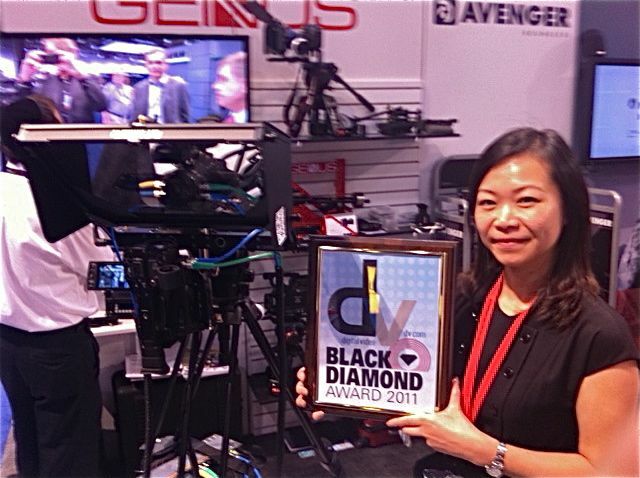 The team at Genus are excited to announce that the Genus Hurricane 3D Camera Rig has won the prestigious DV Black Diamond Award for Best of Show NAB 2011. The DV Black Diamond Awards recognize outstanding achievement in the advancement of the art and science of video technology. The award adds to an exciting NAB 2011 for Genus, where the Hurricane 3D Camera Rig was a big hit with the visitors to the show and generated a lot of interest. Genus Hurricane 3D rig on comercial shoot. I got back late last night from a big budget cinema commercial shoot where I was working with a pair of F3’s on a Hurricane Rig. All went very well and the DoP, (Denzil Armour-Brown) was impressed by the rig. The overall light weight of the complete system really helped us when moving from position to position. We used a ton of Chapman grip equipment including sliders and dolly’s. I was responsible for the 3D rig, camera setup and alignment as well as assisting the DoP. We shot using 2 sets of band new Zeiss Ultra’s, mainly at 32mm and 50mm (very nice) as well as some older and very heavy Arri 100mm macro primes. There were several lens changes during the course of the day and the grip people were very impressed by how quickly and easily we could change lenses. Simply sliding the cameras back on the base plates gave enough space to swap out the lenses. Alignment then took just 5mins, so a complet lens change and re-align took about 15 mins. We were recording to a Nano3D (2 x Nano Flashes) as well as to a Mac workstation recording ProRes in the video village. The video village allowed for instant playback on 50″ 3D monitors in a blacked out tent for review and tech assessment. It was an outdoor shoot in great weather. As well as the F3’s there was a second rig with a pair of Phanton HD Gold 35mm high speed cameras shooting 3D at 1000fps. So even thought the sun was shining brightly, many shots were done with 2 or 3 18kw lamps!! Towards the end of day the F3 rig was tasked with shooting some blue screen and other effects shots and in effect I became 2nd unit DoP. The effects shots will be matted in to the finished commercial. I’m under NDA so can’t talk about the subject just yet, or post any pictures that show the subject, but once the ad is released (2 weeks time!!) I’ll be able to post some grabs and more photos. A pair of Genus Hurricane 3D rigs was recently used with Canon camcorders to shoot the movie Night of the Living Dead 3D: ReAnimation. The cameras were used in many configurations including handheld, on Stedicams, camera cranes as well as on traditional tripods and pedestals. The ability to use the rig in all of these situations shows just how versatile the Hurricane rig really is. Director Jeff Broadstreet’s movie will use a mixture of on set practical effects and 3D CGI effects to bring hundreds of corpses back to 3D life. Stereographer Andrew Parke chose the Hurricane Rig as it fitted the movies budget and had greater flexibility than other lower cost S3D rigs. Handheld Hurricane 3D rig on NOTLD. Just a note to say pop by and see me and Manfrotto at South by South West in Austin Texas next week. Manfrotto have a trade stand at the event and I will be there doing demos of the Genus Hurricane 3D rig. So please drop in and say hello. We should have a couple of rigs on the stand and a nice big 46″ monitor to show the results on. Manfrotto To Distribute the Genus Hurricane Rig. Manfrotto will be handling distribution of the Hurricane Rig in many countries, notably the USA and UK as well as much of Europe. Rigs will be available from approved and trained Manfrotto dealers very very soon. I’ll try to list accredited dealers here as I get notified of them. For sales in countries NOT supported by Manfrotto as well as the UK you can order direct from here using the contact form on this site, or from Genus (www.genustech.tv). Full production rigs are shipping now at a great price, we can even supply a nice flight case if required. Alister Chapman is a professional TV cameraman and editor with over 20 years in the business. Originally training as an electronics engineer Alister has always enjoyed developing new ideas. In the 1980?s he helped pioneer light weight in-car camera systems for race cars. He then went on to make use of miniature cameras in all kinds of unusual situations from windsurfing to snowboarding. In recent years Alister has produced natural history documentaries for National Geographic and provided high quality stock footage of extreme weather and other natural events to broadcasters, museums and corporate clients all over the world. Six years ago he started to experiment with stereoscopic 3D using a pair of consumer cameras on a home built rig. That experimental work soon lead to commissions for big budget 3D projects for multi-national companies from Sony to IBM. At the same time he started shooting some of the worlds natural extremes in 3D. These projects and Alister’s stock footage assignments often required international travel and with no manufacturer producing a truly portable, broadcast quality 3D HD rig, Alister had no choice other than to develop his own. Over two years his early designs matured into a stable, versatile, lightweight rig that can be packed down into a single flight case. He has used his rig to film in the cold of the Arctic at -36c and in the heat of the Arizona desert. In April 2010 Alister demonstrated his rig at NAB in Las Vegas, almost immediately he had a queue of people wanting him to build a rig for them.